April 16, 1819, Boston, Massachusetts. February 2, 1881, Manhattan, New York. Saint Johnland Cemetery, Kings Park, New York. Edward was the son of Ab­iel Wash­burn and Paul­i­na Tuck­er, and husband of Fran­ces Hall Linds­ly. He attended the Bo­ston Latin School, where he won a Frank­lin Medal, then studied at Har­vard. When he graduated from Har­vard on August 29, 1838, the order of exercises for Commencement listed A Dissertation, The Sensibility which terminates in Imagination, Ed­ward Abi­el Wash­burn, Bos­ton. After Har­vard, Wash­burn studied theology at An­do­ver and New Ha­ven, and entered the Congregational ministry. In 1844, having been ordained in the Pro­test­ant Epis­co­pal Church, he became Rector of St. Paul’s, New­bu­ry­port, Mas­sa­chu­setts, where he stayed until 1851. He spent 1851–52 visiting Egypt, Pal­es­tine, In­dia and Chi­na. 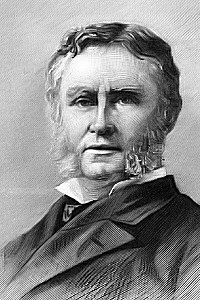 He then served as Rector of St. John’s, Hart­ford, Con­nec­ti­cut (1853–62); Professor Church Pol­i­ty at the Ber­ke­ley Divinity School, Mid­dle­town, Con­nec­tivcut; Rector of St. Mark’s, Phil­a­de­lphia, Penn­syl­van­ia (1862–65); and Rector of Cal­va­ry Church, New York (1865–81). In 1871, Washburn was a delegate to the Evan­gel­i­cal Alliance, and in 1872 he visited Spain with Professor C. M. ­. In 1873, he attended sessions of the Evangelical Alliance in New York, and in 1879, visited Basel, Switzerland. In the summer of 1880, he traveled on horseback in Virginia and North Carolina.